Ah, this is my last wallpaper for the summer vacation, I go back to school on August 15, hope you like it! Anyways, the scan used was submitted by nat. I re-cg'ed part of the scan because there were words on top of the picture, and the original scan was badly textured because of scanning so I blurred the image a little to get rid of it. The city in the background is an actual photograph of a city in Germany, forgot the name. It's been edited to fit in with the wallpaper. And the night sky was rendered in Photoshop. There were 25 layers total after merge some layers because psd files at 2048 x 1536 resolution tend to use a bunch of memory and space. And total time spent is about 8 hours. Anyways, all comments are welcome and I hope you like it! 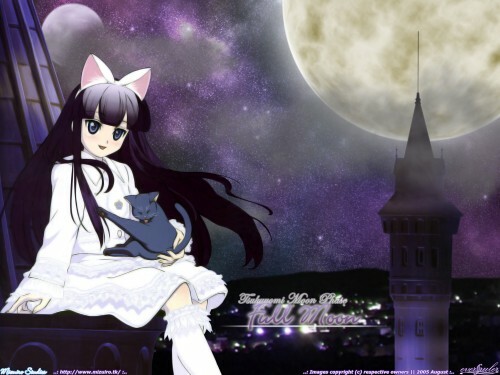 Browse Tsukuyomi Moon Phase Gallery: Recent | Popular. Another beautiful wallpaper. She goes well with this image , the very European, well it is Germany, town in the picture helps make me see her almost as a mysterious legend of the town brought to life. I don't know why that image comes to mind but it does comes to mind. I agree with changing the fog to a lighter shade of gray maybe a white, it would help make some of the stars become more visibile and lighten the feel to a point of the picture. Overall though a great job! Very nice wallpaper! The scene looks awesome and the girl matches it. The moons and sky look awesome as well. I also agree with the others though, the fog could be lighter. Nevertheless, great work! This is very well done!! I love the sky, the moon looks really good too. ^_^ very nice job! I like the background especially. It is very nice. Great job!! Keep up the good work. Awesome wallpaper, good scan of Hazuki-chan excellent night effects. Keep up the good work ^_~. The girl is well match the bg. Ahh, a neko-girl sitting on a rooftop !! I've never seen this anime but i tink she's some kind of vampire righr? Anyways... The nebula is the sky loosk great! So does the starfield! I like how her dress contrasts with the background! I love it ;3 it so awsome I like the moon YAY! Nice work.